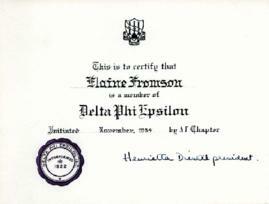 Certification that Elaine Fromson has been admitted as a member of Delta Phi Epsilon, and was initiated in November 1954. 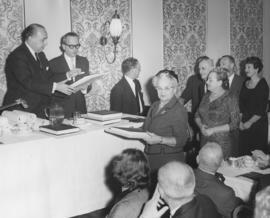 Photograph depicts a line of people receiving books and certificates from two men at the head table. Photograph depicts (l-r) Jack Diamond accepting an award from William Saywell.Written on the verso: (Left) Dr. Jack Diamond, O.C. SFU President William Saywell. Distinguished Leadership Award presentation Oct. 24/91. 155%." Photograph depicts Dr. Mathew Waterman giving an award to David Nemetz. Photograph depicts Alec Jackson with two unidentified men at a B'nai B'rith Evergreen Lodge installation ceremony. Photograph depicts Alec Jackson shaking hands with a newly installed B'nai B'rith Evergreen Lodge member at the installation ceremony.